About Kathleen Van Valkenburg, M.D. Dr. Van Valkenburg actively pursues ongoing training in her field and has extensive volunteer service abroad. Dr. Van Valkenburg joined SightMD in 2015, bringing over twenty years of clinical, educational and surgical experience. Raised in the Midwest, she graduated from the University of Minnesota and immediately headed to New York to pursue graduate studies. She received a Masters of Science degree from New York University and completed additional pre-medical studies at Columbia University. During medical school at New York University, she did research at Manhattan Eye & Ear Hospital in diseases of the retina and macula. Her research and publication in Fluorescein Angiography became the impetus to pursue a career in Ophthalmology. 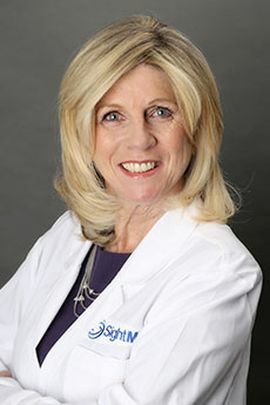 Dr. Van Valkenburg completed her residency at North Shore University and has been in private practice in Manhasset and Garden City for over twenty years. Known by her patients as âDr. Vanâ, her practice is focused on Comprehensive Ophthalmology and Ophthalmic Surgery for families and takes great pride in the long term multi-generational relationships that have developed since the beginning of her Residency. Specifically, she has expertise in surgical and medical management of Glaucoma, Cataracts and Refractive surgery. Dr. Van performs the most state of the art cataract and laser surgery and enjoys seeing joyful patients after offering them the most up-to-date intraocular lens implants. In addition, the office provides advanced technology for evaluation and treatment of serious and rare eye diseases. The office prides itself in accommodating ophthalmic emergencies and effective communication with consulting physicians. Dr. Van Valkenburg is Board Certified in Ophthalmology and continues the extensive continuing education required by the American Academy of Ophthalmology for active board certification. She is a member of the Long Island Ophthalmology Society, American Society of Cataract and Refractive Surgeons, and the Nassau County Medical Society. Dr. Van Valkenburg continues her active involvement in the education of ophthalmology residents and enjoys mentoring ophthalmic surgery techniques to future eye surgeons both locally and abroad. Internationally, she had has extensive volunteer service abroad, providing Cataract surgery and ophthalmic care to under-served communities. She has traveled to countries such as Peru, Belize, Honduras, and Ghanna, often bringing medical students and her own children along. She is a Fellow for Unite for Sight, a Global Health organization that provides quality eye care to communities that are unable to afford eye care. Dr. Van has been married to her husband Paul for 28 years and she has three children. She is an avid downhill skier, enjoys cycling, golf, travel and bridge. She looks forward to welcoming new patients to her practice and continuing her long term relationship with established patients.